Plastic Soldier Review - "Modellwelten V"
Home > Features > "Modellwelten V"
This is volume five in the expanding series of films on the subject of miniatures, and this time the subject is how our favourite works of art are sculpted. Basicly there are two ways of sculpting figures. One is to sculpt them in a large size and pantograph (reduce) them down to 1/72 scale so the mould can be made, but this is a very expensive process many manufacturers cannot afford. The alternative is to sculpt the figures in 1/72 scale right from the start, and that is what we are invited to watch in this DVD. 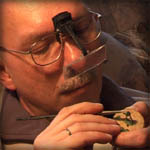 We observe as Wolfgang Gebranzig creates a unique figure using wire and clay, gradually building the figure up until the finished article is ready to be moulded and cast. 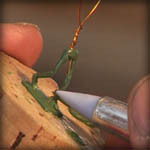 As he works there is some commentary on what he is doing, but at times we simply watch him create while music plays in the background. As the program points out the process is long and slow, and we only watch a 'highlights' version. However the program still lasts over an hour, and to be honest this seems like dragging out the interest a little too thin, with perhaps a half hour program providing just as much information and interest. 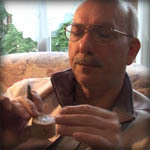 Having said that what the sculptor achieves is impressive and it is always interesting to watch a craftsman at work. There is also an element of mystery as to what the end result will be - those familiar with the Australian entertainer Rolf Harris might recall his speed painting when he would ask if you knew what it was yet, and the same guessing game can be played here. As well as the main program there is a short film on the tools used by the sculptor, which also discusses some of the effects achieved with them. As always with this series the production values are extremely good, with the usual miracles performed filming such a small object. The commentary is in German but for the first time there are also English subtitles, although these are a basic subset and at times the commentator talks with nothing subtitled. Few people will probably ever want to sculpt like this, or be able to, so for most this is just an interesting glimpse into some of the effort that lies behind the figures that eventually find their way to the pages of this website. Unless you intend to scratch build figures it does not offer any practical tips such as were found in previous instalments of Modellwelten, but it certainly adds to the sense of wonder at what some sculptors achieve.